Updates to Phillip L. "Larry"'s profile since your last visit are highlighted in yellow. 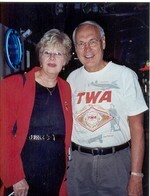 Retired from TWA after 41 years in 2002. I could not stand retirement so I became employed at the Sheraton Grande at Sacramento. I work part-time on the Club Level (26th floor) 5 hours a day. Phillip L. "Larry" Janzen has a birthday today. Phillip L. "Larry" Janzen updated profile. View.